Yesterday’s deer camp breakfast: cherrywood bacon, Tennessee Pride, fresh yard eggs, fried taters and wampum biscits. That's a plate full right there!!!! Sausage, bacon, egg, apple butter, swiss cheese,,,,,, and boy were they tasty!!! 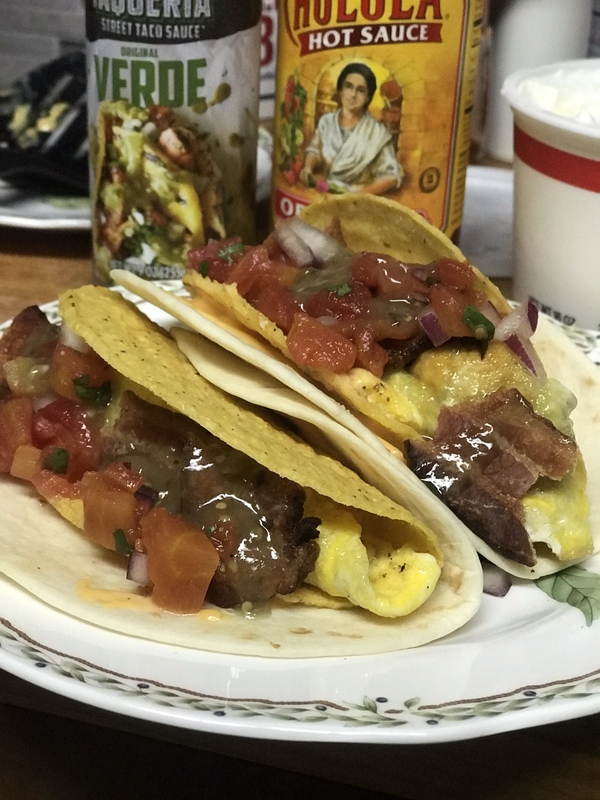 You inspired my breakfast this afternoon....eggs, cherrywood bacon, cheese, salsa, taco sauce double-decker shells with cheese between 'em...oh yeah. I'd have that....and sleep like hibernating bear in the stand. That’s why we eat breakfast after we get done hunting in the morning. I hear ya. That sounds like a super plan.....then some lazy time before getting into afternoon plans. To quote something I haven't seen you post in a while,,,,, BAMSUCKA!!!!! I bet the crunchy shells add an interesting layer to that fine looking breakfast!!! I just ate dinner and now I am mad. Grrrrr! My wife fixed this for us in the RV yesterday. Weather at DeSoto has been awful. Maybe I can break out the Blackstone next week. We came home today so we would not miss church tomorrow. Gonna take two grand youngins back to DeSoto with us tomorrow afternoon. And you don't even have to wash the plate,, win win! Threw a little something together for the crew at the farm this morning. 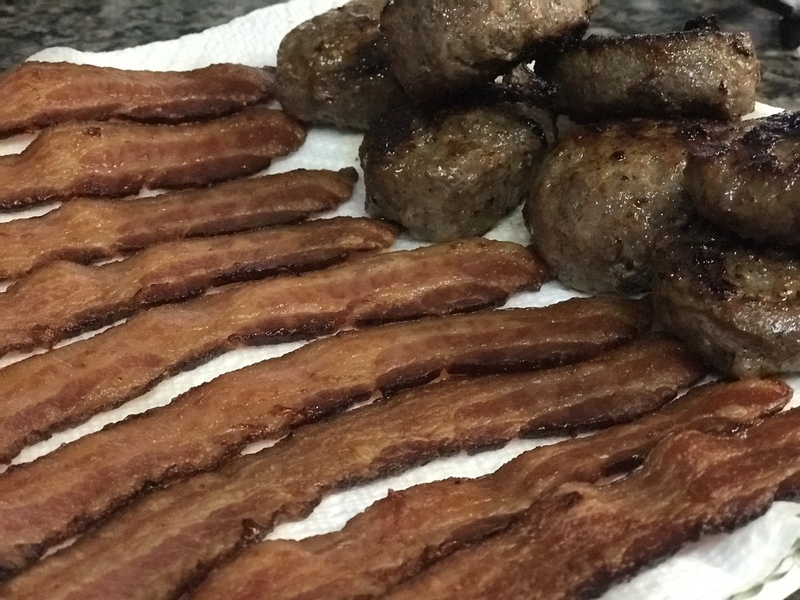 Started out on the Blackstone with a pound of bacon and some home grown sausage. Finished it up in the kitchen. Ate pretty good. Triple C that is as fine a breakfast as a man could ask for. That sausage looks extra good. I love some good sausage. 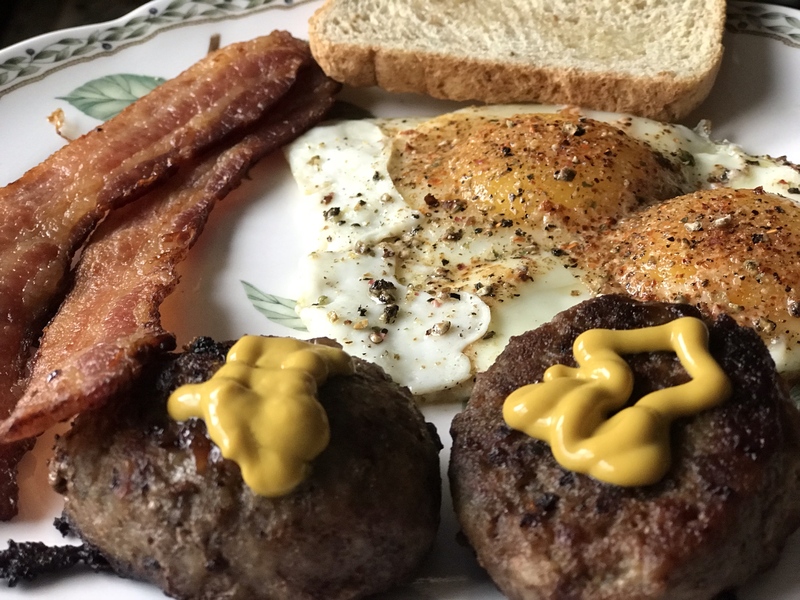 Technically not breakfast since it was mid-afternoon, but little snack I brewed up after I came in from hunting today: Cherrywood bacon and an over-easy bird's nest fried in the bacon grease. Yes, I fried the toast hole and ate it, too. Supercalifragilisticexpialidocious. I got nothing else. My Grandma.....Dad's mom....used to take those all the time. Grand slam home run belt-buster spread right there !!!! That's my kind of breakfast there! Well I'm a little weird I guess... This was what I was craving.. Fried taters, chorizo, pintos, onions, jalapenos... It's was great! Family loved the Smithfield Applewood bacon that NCHB & GA1Dad use. Also cooked up a pack of JD Hot. Slid the eggs up top of that toast and went to town. Oh yeah.....the plot twist on this workweek & schoolweek Monday is........that I have to do neither. Put in a 40 hour workweek the past three days. Today is for chillin'n' grillin. Gonna enjoy my Texans tonight on MNF !!!!! !